But as the revolution continues to gain momentum, and Giselle grows closer to the Queen, becoming one of the few trusted servants, she finds herself dangerously torn. Violence is escalating; she must choose where her loyalty truly lies, or risk losing everything...maybe even her head. The French Revolution is one of my favorite time periods to read about, not because I admire the way it went down--quite the opposite--but because it lends itself perfectly to historical fiction and trying to understand what it must have been like to live through such terror and uncertainty. I was drawn to The Wardrobe Mistress particularly for the perspective of a woman in charge of dressing Marie Antoinette. From a comfortably upper middle-class family, Giselle is thrilled to earn a position in the queen's household. An aspiring dressmaker, she hopes to further her craft and establish the connections that could allow her to open her own business in the future. Though the queen is glamorous and pampered, Giselle sees firsthand the work it takes to make the queen formidable in the face of her enemies, and she witnesses the queen's sorrow as civil unrest grows and the king's enemies blame her for their problems. Giselle comes to admire and pity the queen, but when she falls in love with Leon, a young revolutionary, she is caught between her respect and admiration for the royals and the growing animosity from the lower classes, to whom she also feels some loyalty. Tasked by her uncle Beaumarchais to supply him with any information that might be pertinent to national security and challenged by Leon's increasing revolutionary fervor, Giselle must tread a careful path to avoid falling victim to political persecution. And when the mob becomes murderous, storming the palace and eventually capturing the king and queen, Giselle must find a way to avoid being taken down with them. I don't know that there's anything new or revelatory here, but the graphic depictions of mob violence and the honest portrayal of the dangers of a civilized society becoming too polarized and politicized are frightening. And I appreciated the viewpoint of someone privy to the more intimate circumstances behind Louis XVI's and Marie Antoinette's actions. I'm a fan of romance, but I found the love story here to be too sweet, almost saccharine, and a little too much the focal point at times. There were a couple of twists toward the end that made for a more nuanced and poignant conclusion, though I did think the ending too abrupt. It needed one more chapter to give the reader--and the story--closure. But the story does a good job of capturing the paranoid, frenetic culture of the revolution and how an innocent young woman could unwittingly find herself on the wrong side of it. 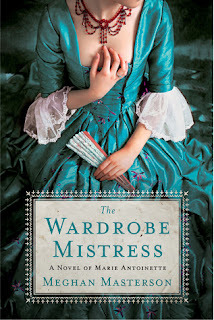 At times gay and glamorous, at others gritty and gruesome, The Wardrobe Mistress is a thought-provoking and entertaining read. Thank you for the review A new one for me. Great review! I've never heard of this book before but it sounds really interesting.